The Samsung I9505 Galaxy S4, the Snapdragon 600 one, got a software update and while we felt like a new battery test was in order. A lot has changed since we released our first test and we were curious to find out how it has affected the smartphone’s power autonomy. After the update, the battery life of the phone did improve overall. Here are the new results. Note: the old results are marked in yellow. Talk time saw a massive improvement of just over 4 hours, putting the I9505 Galaxy S4 close to the top of this chart. 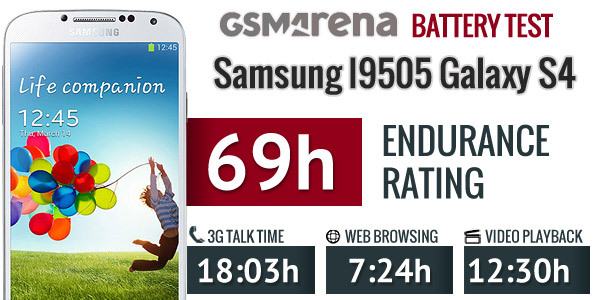 We have rarely seen better performances and it’s quite unlikely you’ll deplete your Galaxy S4 battery just by talking. Surprisingly, web browsing started killing the battery faster after the update – an hour and twenty minutes faster to be specific. At 7 hours and 24 minutes, the new Galaxy S4 result isn’t bad, but it’s no longer one of the best. Video playback compensated with an improvement of just over 2 hour, once again putting the Samsung Galaxy S4 close to the top. With this improvement, the Samsung flagship managed to overtake the iPhone 5 and the even the Galaxy Note II. Standby power usage doesn’t seem to have changed much, but the (mostly) improved performance in the individual tests did push the endurance rating up to 69 hours (up from 63 hours). 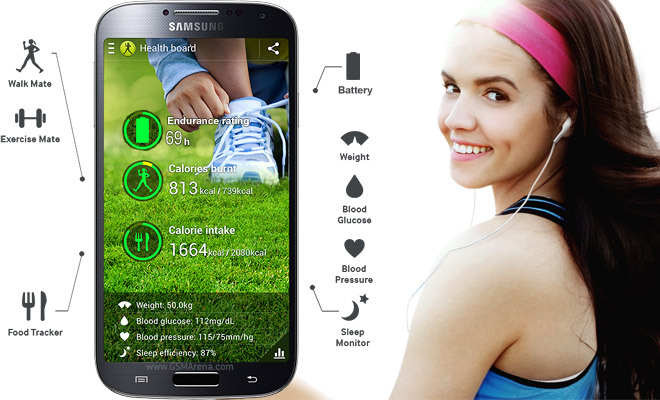 The Samsung Galaxy S4 was one of the most solid performers when it comes to battery life and it’s now even better. By the way, we’re running our battery tests on the Exynos 5 Octa version of the Samsung Galaxy S4, that’s the I9500, and we’ll report back when they’re done. Those Cortex-A7 cores better justify the existence of the I9500 as the Cortex-A15 and PowerVR SGX544MP3 don’t really offer all that great performance boost.